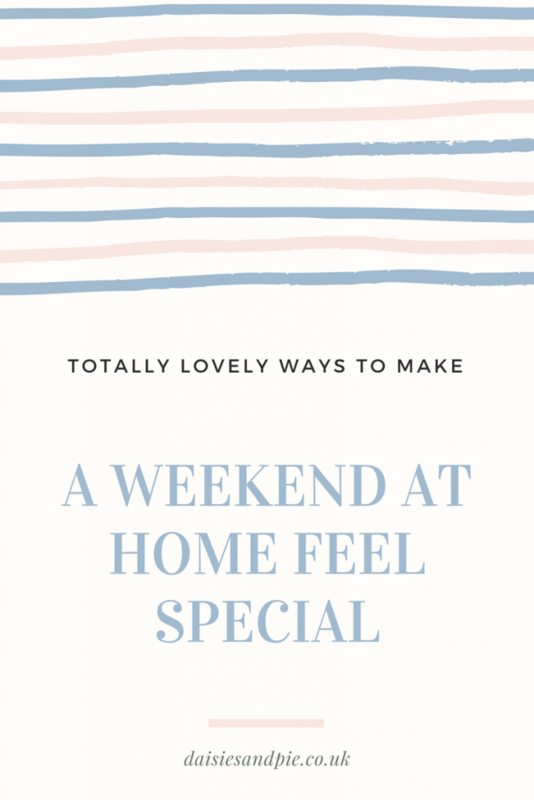 It’s really easy to make spending the weekend at home feel special. Just a few little plans and nice touches will make you want to not leave home for a second. And there’s nothing better than a really relaxing weekend at home with the family. Think of it as a low cost mini staycation. Don’t waste a lovely weekend cleaning up, do a quick spruce of the house and any jobs that need doing on Thursday evening so that you can just relax for the whole weekend without having to look at a messy house. Think flowers, wine, chocolate, a handful of magazines, treats for the kids, whatever you fancy. It’ll all go to make your weekend much more lovely. Order the food shopping online so that you’re weekend starts the minute you get home on Friday, without the stress of battling around the supermarket. Whatever works for you, maybe Friday treat tea, Saturday TV dinner, long lazy brunch or traditional Sunday roast with all the trimmings. Maybe invite over some friends. If the weather is good spend some time outdoors. Maybe a BBQ or sit huddled around the fire pit toasting marshmallows. Nip outside for your morning coffee and watch the world go by. Put time aside to do something with the kids, whatever they fancy, games night, watching X Factor, baking, watching films, whatever your kids are into.